Chariot, among ancient nations, a two-wheeled carriage, open above and behind and closed in front, and used in war, in public games, and for the purposes of common life. 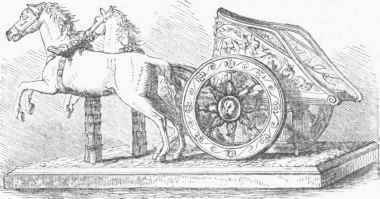 The axle of the Greek chariot was usually made of oak, ash, or elm, though Homer describes the chariots of Juno and Neptune as having metallic axles. 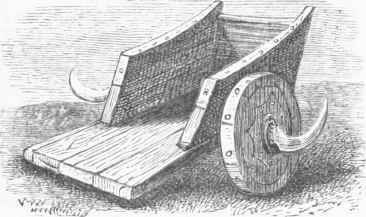 The wheels were about four feet in diameter, and each consisted of a nave bound with an iron ring, of spokes, a felly of elastic wood, and a heavy iron tire. They were fastened to the axle by pins, and the overthrow of Œuomaus in his contest with Pelops was caused by the treachery of his charioteer, who inserted a linchpin of wax. The Lydians and Romans sometimes attached two or three poles and spans of horses to their chariots, but the Greeks rarely added a third horse. From the earliest historic periods chariots were used in war both by the Asiatic and the classic nations. The famous scythe chariots, whose spokes were armed with long hooks and sickles, were chiefly used by the ancient Persians, Britons, and Gauls. The warriors of highest rank among the Hebrews, Greeks, and Romans either fought from their chariots, or sometimes in close combat dismounted. In the Roman games chariots were often decorated with sculptures and enriched with gold and ivory. The triumphal chariot, which was usually made of ivory, adorned with the utmost skill, and drawn by four white horses, was one of the chief ornaments in the celebration of a victory. The chariot was an attribute of the mythologic divinities, especially of Victory, Night, Apollo, and Diana.